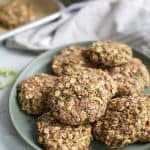 Healthy Zucchini Breakfast Cookies are a great addition to breakfast or make for a perfect healthy snack. Vegan, gluten-free, oil-free and nut-free friendly (just use sunbutter if needed! Quick and easy recipe. Preheat oven to 350ºF and line large baking sheet with parchment paper; set aside. In large bowl mix together oats, protein powder (if using), hemp hearts, chia seeds, cinnamon and pinch of salt. In medium bowl mix together applesauce, nut or seed butter, honey and vanilla. Add into bowl of dry ingredients along with shredded zucchini; mix with large spoon or sturdy spatula until well combined. Using medium cookie scoop or 1/4 cup, scoop dough into ball then shape into flat circle with hands, about 1/2″ thick; place evenly on baking sheet and bake for 10-12 minutes. Allow cookies to cool on baking sheet for 5 minutes before transferring to wire rack to cool completely. It’s best to use a plant blend protein powder here like ALOHA or Vega. f you’d like to omit, you should be fine to use 1/3 cup more quick oats in place of the protein powder. Let me know if you try this!